Going Uphill is one of the most challenging elements of cycling as well as running. Since my primary sport is cycling, last year I wrote about my tips for cycling uphill. This year i am going to be pushing much more uphill riding, so I went back to re-reading the tips. I wrote the tips before tackling the most challenging climbs of last year, and now I feel that I need to expand on the original list. What follows is the extra tips on cycling uphill. Also read the original post here. Physical preparedness - good physical preparedness is a must. You have put in tens of kilometers of distance, did your interval training. But you also must focus on your core muscles. Your core muscles support your extremities, and provide the base from which your legs can propel you forward. Planks, side planks, push-ups, crunches, wall sits are your recipe for a great physical platform for tackling the uphill. Good technique and form - proper cycling technique and form is very useful for a good climb. Keep your back straight, elbows out and spin the pedals in a circle. Also, avoid standing up and cycling, since standing is more powerful, but it spends much more energy and the pulse is much higher. Be patient, stay in the saddle and climb by cadence, not by raw power. Stand up only to stretch and to change the position for a short while. Mental preparedness - the most important element of all. I have seen people with much less training conquer climbs since they have a much better mental position towards the climb. You need to accept that the climb will be difficult. There is no rushing a climb, so take your time (unless it's a race). The climb has no interest in how tired you are, so there is no need to get angry and pissed off that the climb doesn't level off when your pulse is passing 180. 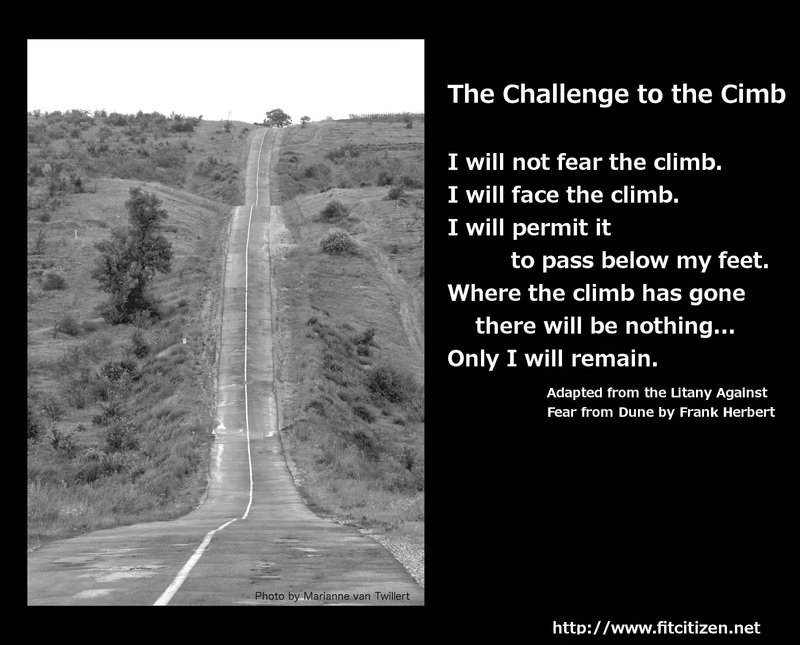 Just embrace the challenge in front of you, and make a challenge to the climb. Here is a motivational poster to help you on that. The original is the "Litany Against Fear" from one of my favourite books - Dune by Frank Herbert.